In today’s post-digital architectural era, a strong dichotomy exists between the increased agency offered by our design tools and the affordances given by many construction contexts – especially building environments of developing countries with limited available onsite means, skill, budget, or time.This lecture postulates that by incorporating incertitude as a productive and constructive component in alternative computation-driven design and materialisation processes, the locally available solution space for built architecture can be dramatically expanded and onsite ability and agency increased. Illustrated through his highly unusual and provocative work built in China, Kristof Crolla proposes an alternative computation-driven design and materialisation methodology that capitalises on digital design models’ propensity towards designing multiplicities and uses this for the design of singular solutions in highly volatile contexts. Through digital design models, named “Vibrant Objectiles”, that are capable of procedurally absorbing serendipity throughout the project crystallisation process, uncertainties are given room to feed back into the system and provide rigour and animus to the whole. Thus, fluctuation is embraced as final, singular, site-specific design expressions emerge in the epigenetic process. The work demonstrates that identified methods can substantially increase the architects’ agency and local onsite affordance. In doing so, the case is made for more democratic epistemic models and more intelligent structures of approximation than (common) deterministic approaches in digital design would allow for, challenging the extent to which computation can further impact architectural practice. Dr. Kristof Crolla is a Belgian architect who combines his architectural practice Laboratory for Explorative Architecture & Design Ltd. (LEAD) with an Assistant Professorship in Computational Design at the Chinese University of Hong Kong, School of Architecture (CUHK). He received his PhD from RMIT Melbourne, trained and taught at the Architectural Association, School of Architecture (AA) and worked for many years for Zaha Hadid Architects, London. In 2010 he moved to Hong Kong, where his academic research and office work focusses on the strategic implementation of computation in architectural design practice. For this, he received over thirty international design, research and teaching awards, including the G-Mark (Japan), Architizer A+ (USA) Awards, the 2016 World Architectural Festival Award - Small Project of the Year 2016, and the RMIT Vice-Chancellor’s Prize for Research Impact (for PhD research set to complete in August 2018). 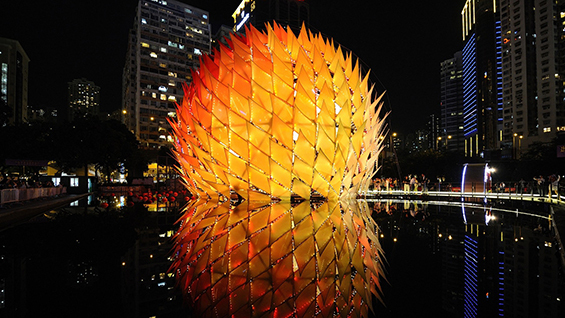 Most notable projects include ‘Golden Moon (Hong Kong, 2012)’ and ‘ZCB Bamboo Pavilion (Hong Kong, 2015)’.